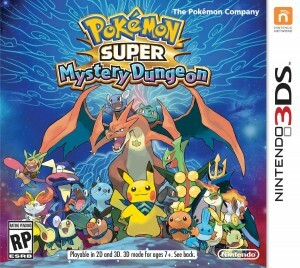 Pokemon Super Mystery Dungeon is the newest title in the Mystery Dungeon franchise and after the… disappointment with Gates to Infinity, I was really hoping for this game to be good. I will say it is easily much better than Gates to Infinity, but the one thing a lot of people have been asking is if it’s on par with Explorers of Time/Darkness/Sky. To be honest, I don’t know if I would say it is or not. 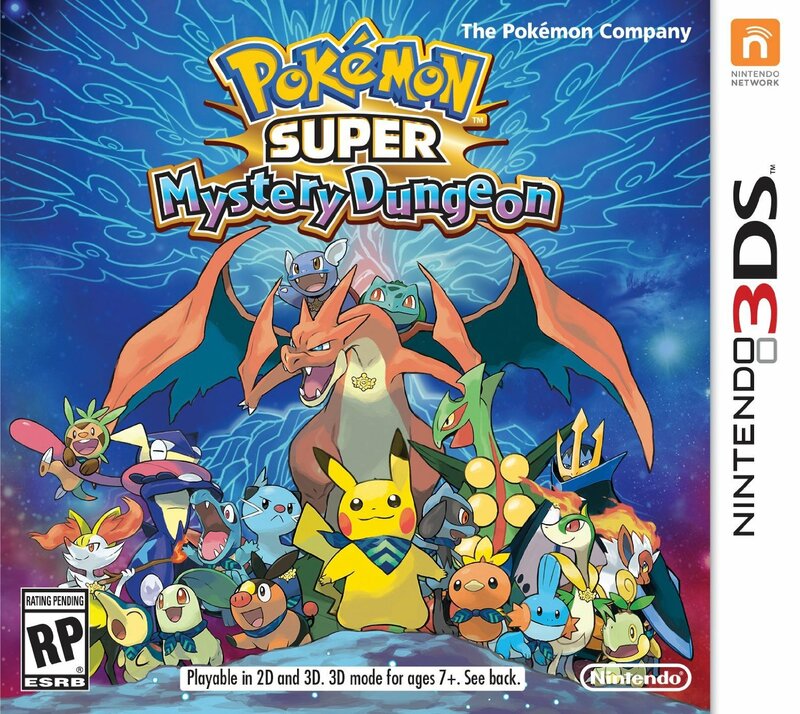 Saying not to compare the games would be silly, after all, they are part of the same series and Super Mystery Dungeon contains references to all of the past games. 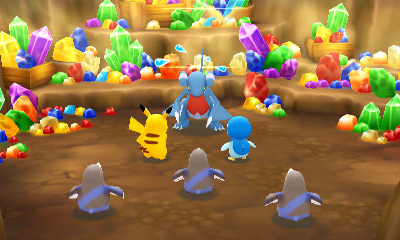 Some parts of Super Mystery Dungeon I do feel are on par with the second games in the series–others I would say are not. That said, I don’t feel it’s disappointing, but I think whether it’s as good or better than Explorers of Time/Darkness/Sky will vary from person to person. With that said, I’ll go ahead into the main review. Please keep in mind this review will contain spoilers. While I was super happy to see the Personality Quiz return, I’d be lying if I said I was thrilled with how it turned out. This is because the personality has very little to do with what Pokemon you get. Every question with just the two answers will help you figure out your personality. The two questions with four answers will figure out your Pokemon. The cute/cool has nothing to do with the personality beyond what gender difference you will have for those Pokemon that have one. As much as I still enjoyed the personality quiz as is, it felt disappointing when I could get any of the Pokemon regardless of what personality I received. Making it so the personality was separate from the Pokemon just cheapened a lot of the experience to me and made it feel all for naught considering the personality has nothing to do with the story. In a similar sense, it was nice to have a large amount of Pokemon to pick from, but it still felt a bit disappointing due to it being nearly all starters–the only exceptions being Pikachu (who was a starter in Yellow) and Riolu. 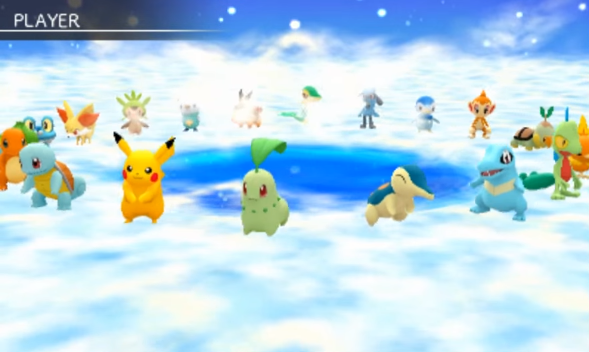 Considering how many throwbacks and references there are to past games along with all 720+ Pokemon being in this game, I feel like it’d have been a great opportunity to include all the past Pokemon that could be the player character and/or partner. As for when you actually start playing, it’s the usual story of you turning into a human with the traditional dungeon crawling. I will say the tutorial was rather long this time around, but considering a lot of the changes, it’s not too surprising. The battle system has changed a lot with how you attack and one of the big new features is “pushing” which, while I do not hate the feature, I wish had an extra button to hit rather than being the default if you move into your partner or another member of your party. I’ve lost track of how many times I’ve pushed Pokemon over switching places just out of habit from the past games. It really isn’t a bad feature and I can think of plenty of reasons why it’s handy, but I do think making it the new default was a poor choice. One of the things I do feel was done poorly in the game however were making existing things a bit more convoluted–I wouldn’t say all were for the worse, but part of me wonders if they were really needed. The first big change is linking attacks is no longer a thing–this is changed into the Alliance feature which allows you and your party members to attack an enemy all at once with the attacks of your choice. They work the same way (ignoring bad type matchups and depleting hunger quicker), but I find I rarely remember to use them, even when they could be helpful just due to the way they’re done. Second is a complete wipe of the IQ system to the Emeras and Looplets system. I will be blunt and just flatout say I hate this system. It’s not necessarily bad, but the main point of it is you lose any Emeras you had during the dungeon once you leave (and in some, this includes half-way points or switches to a new dungeon even if it’s all in the same journey). One of the things I liked about the IQ system is how you earned these perks and thus, became a better Explorer and were better able to handle different environments and Pokemon. Switching it to a temporary system removes a lot of that feeling of progression and it’s just really disappointing. Like IQ, many are ridiculously helpful in certain dungeons and it’s not a feature you can freely ignore without making things too difficult. I always felt the IQ system was a really great feature so seeing it traded out for a temporary variant of it is probably one of my least favorite things about the game. And yes, I know some people especially feel some of these emeras are overpowered, but we will expand on that more in a later section. Mega evolving is also through this system with an “Awakening” Emera. Using it on a Pokemon that doesn’t Mega Evolve gives them the Awakened status with none of the other changes. It let’s you dodge from the front and makes you stronger and really is pretty good, but only lasts for a limited amount of time and is the one Emera that will likely expire before the dungeon ends. Mega evolving still just… does not make much sense when it comes down to it. It’s not surprising for a side game to make their own rules about it, but it’d have been nice if they could have just kept them separate from this system and made it more like the Anime specials where they can keep the appearance if they want to. Third is the new recruitment system. This is one of the few where it’s kind of a mix–I really enjoy not having the recruitment being completely random like the past games, but I do miss the fun of randomly fighting a Pokemon who will suddenly decide to join you and being able to have multiples of any Pokemon you felt like. The connection orb is pretty random with how it works due to recruitment and missions essentially being joined together over an occasional crossroad. I will say the Battle missions and some “Secret base” missions are a bit cruel–the Battle reminding me of battling Kecleon in the past games (though, at least you only need to beat the “leader” for it to end) while the latter can end up being a trap to Monster House city. The Secret base one can at least be cute otherwise and at least you just need to run to the stairs for it to be over if you do end up with a trap one. I would say my favorites though are just when you randomly find a traveling Pokemon on the floor and get to talk with them and exchange notes. I think that’s a really great feature and really gives the idea of explorers traveling around rather than you seeming to be the only team ever in each dungeon. There are occasionally ones where you need to revive a random traveler as well. It’s just such a good way to show how expansive exploring is and might even be my favorite new feature of the game. One of the big things with the recruitment system though is you will only ever get one of each Pokemon. If you decide to evolve a Skitty into a Delcatty, you will never get another Skitty. You also can’t nickname any of the Pokemon who join your team. Going back to the way Dungeons work, there are a few changes such as only being able to have three party members. 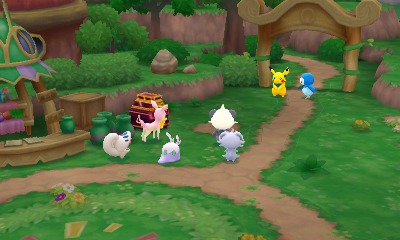 You can occasionally have 4 or more members if they are forced along for their mission, but you can’t interact with them beyond fighting together (so no giving them hold items or picking up items from under them, etc.). If they faint, they will be warped away and you will need to find them to revive them which is also a bit frustrating. This is slightly made better in the sense that you do not have to revive them or anyone in your party (even your partner). You are always asked about using items from anyone if you go up to them (or prompted for those in your party) and can choose to say no. As long as the Player Character is alive, you can still keep going. Sadly, one thing I did really enjoy from Gates to Infinity though were the outer areas that had puzzles and various things you could find. While you can still find things like that in the various towns, the outer areas with puzzles are gone which is pretty disappointing. Everything is rather straight forward in this game and the few times where a puzzle could be inserted, it’s automatically in a cutscene. Going back to the frustrations with Emeras, they become nearly required in some cases. The game requires much more item management and really using everything the game gives you and while there were always good items for the past games, I never felt required to use them as much as this one. This is because the level differences are rather drastic. In fact, the third required mission to progress has you going up against a level 50 Pokemon when you and your partner will most likely be somewhere between levels 10 and 15. 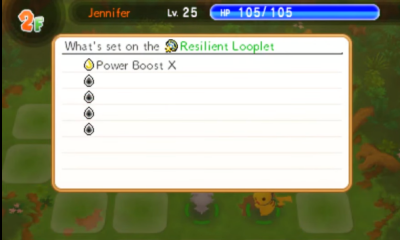 To make matters worse, all these drastic level differences are usually accompanied with the enemy having attacks that not only do over 100 damage (which is more HP than most Pokemon will even have until 40-50), but often will hit more than one Pokemon in the party and thus, are capable of wiping your team every turn. I had an easier time with the final boss who had some clever mechanics to avoid the one-hit attacks with the other attacks doing more reasonable damage than with some of the final bosses at the end of other dungeons, including non-story related. I personally beat the game around level 25 and from most people I know who also finished the game, 20-30 seems to be the magic number for what level their player character is upon completing story and epilogue. The pacing is honestly not too great and despite the large amount of chapters, many are over incredibly quickly. If you can use items well/really work on item management, grinding isn’t necessarily needed, but it may be preferred over constantly having to deal with all the different items and new mechanics. Some of the especially useful Emeras are: Barrage (gives the chance for any attack to hit multiple times in a row without using more PP), Type Bulldozer (Type differences do not matter–there is no such thing as an attack not being very effective), Toughness (chance to survive an attack that would defeat you), and the various Payback/Stare effects which could make a Pokemon warp, be confused, or even sleep when you get hit or you hit an enemy. They become such a big help, and almost feel required, for some of the big boss battles as they can literally mean life or death–especially as they don’t require a turn to activate. The story is actually very similar to Gates to Infinity with the main big bad once again being created due to negative feelings from all the Pokemon of the world. I do feel it was better done in this game though which really just makes Gates to Infinity seem even more like a test game. Things get really odd from a timeline perspective though as any major NPC from a past game is that same NPC in this game. Wigglytuff? Yep, your old guild leader from Darkness/Time/Sky. Gengar? Yep, the actual cursed human from the first game. Emolga and Dunsparce? Back as well. The most surprising returnees though are Grovyle, Celebi, and Dusknoir. I guess they are visiting from the future? Maybe? The game does a lot with time travel which actually makes it a bit confusing. Apparently, the same event happening now happened a very long time ago (though, it was not the Bittercold from Gates to Infinity–instead, we have the Dark Matter) and a human was called in to help. Said human (who was turned into a Pokemon because that is just how these games work) worked together with Mew to stop Dark Matter. As Dark Matter is built up through Negative feelings, there is no actual way to get rid of Dark Matter forever. To counteract this, the human is… I honestly don’t know. They never really go into it, but repeatedly say it’s the same human from that very battle. Similarly, Mew is reincarnated into whoever you picked as your partner. How it’s the same human? Who knows? Did you go back to the human world and it just moves much slower than the Pokemon world? We aren’t told. It’s not really expanded on and the situation gets even weirder later. I’m getting a bit ahead of myself though, so let me talk more about the beginning of the story. This game is the first to give some kind of age range of the player character and partner labeling both as “children”. In fact, most of the beginning of the game involves you going to school everyday with the other kids from the village until you become part of the Expedition League as Junior Members (and eventually full-fledged ones). Ampharos is your quirky guild leader this time around. And despite being kids, each of them has a pretty important role–especially Espurr. As always, the player character has amnesia for one reason or another and this time, you are taken under the care of Nuzleaf who reminds me a lot of Dusknoir’s role due to the similar betrayal. Eventually, you and your partner sneak out of the village to head to Lively Town where the expedition society is located so you can be full explorers. The story works itself up quite well once it gets started and other than some of the level issues as mentioned in gameplay, it’s a rather enjoyable story and most of the dungeons aren’t too large (No story dungeon is more than 20 floors for example) so it’s never really tiring–you can always get a good amount of progress done and there are even items in the game that will let you save/pause in a dungeon which is pretty helpful. Most of the issues I have with the game’s story are in the ending itself. So, as I mentioned before, originally the Dark Matter attacked a long time ago and while the player character and partner defeated it, it was not fully gone and this is now repeating itself. Ignoring some of the frustrations of fighting the boss twice, the end is incredibly important. As you’re about to deliver the final blow, Dark Matter starts taunting the two–talking about how it can never be gotten rid of as all Pokemon will be negative from time to time and that if they hit it, all the negativity will spread to all the Pokemon and “Won’t you feel guilty”? While the player character is freaking out on what to do, your partner steps up the plate and tells Dark Matter it accepts it. There will always be negative feelings. It’s unreasonable to think people will never be jealous or upset or angry and that is such an important message. Things shouldn’t be bottled up. That doesn’t mean all negative feelings should be acted upon, but it does mean you should be able to express them. Crying is okay–it’s not a weakness. This acceptance causes Dark Matter to be fully defeated and after a huge celebration thanks to you and your partner’s work, you return back to the town where it started it all–afterall, your partner wants to see Carracosta–their caretaker while they lived there. With Nuzleaf gone due to feeling too guilty to face the player character just yet, you end up staying with your partner at their house for the night. This is where things get very depressing in quite a plot twist. As expected from most Pokemon games at this point, you finished the story and now you disappear, right? You’re a human. You need to go back to the human world. You can say all you want about how you want to stay with your partner and everyone else, but you always end up going back… and then getting brought back anyway, but I digress. This doesn’t happen this time. As you run off to find your partner, they are sitting on the hill with the big tree overlooking the town and they drop everything on you. The reason you lost your memories was actually because of Mew. Mew realized if the two of you still had your memories of last time when you fought Dark Matter together, the same mistakes would be made. It was through the new friendship of you and your partner that you were able to stop Dark Matter for good. But because of this, your partner is actually the one to disappear. It’s an odd feeling for the Player character to then work to get the partner character back this time around and while you do rescue them (after going through some frustrating dungeons), I’m still not sure how I feel about it. I was still as upset as I am everytime I beat a Mystery Dungeon game, but it just didn’t… click right for me? I guess is the best way I can put it? There is so much that doesn’t make sense with the human/Player character in this game and it’s never addressed. You never even get your memories back. How are you the same human? Were you put into stasis? I just find I have so many questions about that and what made it so the human didn’t have to leave this time, that the partner leaving felt incredibly weird despite also being emotional. I still think the story is great, but I wish that was better addressed/written out. 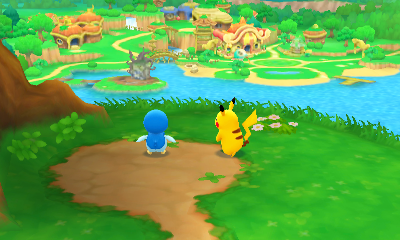 Though, considering all the past characters from the previous Mystery Dungeon games are in here, I don’t think this game actually cares about a Timeline. As always, the game is filled with lots of nice music including remixes of music from the past games. Some of my favorite songs from the game are Treasure Within Your Heart, Partner’s Theme: Music Box, Children Came to See Us Off…, Time to Set Out, Showdown with a Volcanic Entei!, and Within the Sadness. They are just all really well done, in my opinion, and with over 100 songs in the game, there will hopefully be some you really enjoy too. Moving onto Graphics, they are still pretty much the same as from Gates to Infinity just with… a lot more Pokemon. There are some amazing backgrounds though and some really creative types of dungeons. 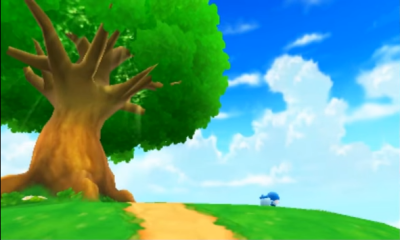 It was nice seeing more cutscenes as well, though, I feel only one was especially action-packed–when your Partner was doing their best to reach the Tree of Life as it was pulled out of the ground. Other than that though, while they are interesting and well-done, I don’t feel they added a lot. There is also a cutscene for every legendary fight as the legendary comes to meet you which are all rather cool. Then there’s like the one cutscene that plays during the credits which is just the player character crying as the partner has disappeared. I wish they did more with it beyond just leaves and clouds moving. Things like the sky changing color to show passing time would have been a nice touch if they didn’t want to show anything else. As mentioned, the game is definitely much better than Gates to Infinity so if you were burned out from the series due to that game, I would recommend trying this one and seeing if it gets you back into it. Even if the story doesn’t quite grab you, seeing all the references from the past games should still make you pretty happy. I do feel most of the issues from the game, besides the few story questions, stem from the large mechanic changes. I genuinely hope the Looplet/Emera system especially is massively changed if it makes a return in the next game if anything. And also just a way to change the controls because I’m not sure I’ll ever get used to pushing being the new default instead of switching places. But yes, overall it really was a lot of fun and I enjoyed it. I don’t know if I personally would put it on par with Explorers of Sky, but at least I do feel it is up there with the first two Explorer games and not another disappointment like Gates to Infinity.